You've been dreaming of this day! Rhinestone bride shirts are perfect for the bride and her whole wedding party. Create personalized bridal shirts for the bride that are as special as the bridal ceremony. All our designs are available for plus size brides. As a wedding gift, you cant give better. Rhinestone Mrs T-shirt personalized with his name. 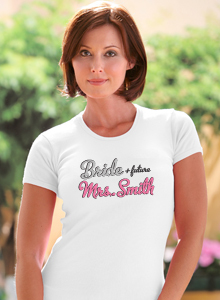 With so many shirts for brides to pick from, why is this our most popular? Our bridesmaid shirt matches the style of our other bridal party shirts. 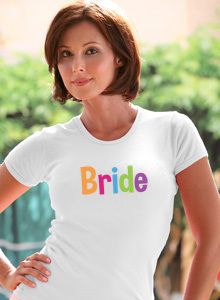 Lots of sparkling rhinestones spell out "Bride"
A T-shirt for the bride, or for the whole bridal bachelorette party. Our bride shirts are dazzling! It's no secret that wedding planning can be stressful; if you want to beat the stress, turn it into a fun event by sporting a gorgeous rhinestone bride T-shirt! You'll breeze through any wedding planning bump with an enviable flair for fashion that will showcase your glamorous and fun personality! Choose Soon to be Mrs. clothing or Just Married T-shirts for after the wedding.